Brooklyn District Attorney Ken Thompson yesterday announced that two former employees of a Sunset Park nonprofit that provides free and low-cost immigration services have been indicted for stealing approximately $17,000 from the nonprofit and at least five clients seeking assistance. The District Attorney said that, according to the investigation, between November 2014 and February 2016, the defendants, Nancy Robayo, 50, and her daughter, Elisa Lascano, 33, allegedly stole at least $7,000 from the Juan Neumann Center, a nonprofit organization affiliated with the Basilica of our Lady of Perpetual Help, and defrauded its clients of another $10,000. Both defendants were employed by the center – Robayo as a book keeper and Lascano in a clerical position. Furthermore, according to the investigation, in the alleged $7,000 theft, the defendants stole parts of fees collected from clients for immigration services provided at the center. The defendants also allegedly defrauded at least five clients of approximately $10,000 by taking payments the clients made for services they believed were going to be provided by the center. In some cases, the defendants allegedly didn’t provide the promised service. In other cases, they either overcharged clients and kept some or all of the money, or they charged for services that the center provided for free and kept some or all of the money. The defendants allegedly concealed their theft by altering receipts, misreporting amounts on receipts, maintaining separate receipt books hidden from the center and warning their clients to speak only with them and to no other employees. Brooklyn District Attorney Ken Thompson today announced that a former New York City Police Department officer has been charged in a 26-count indictment with aggravated vehicular homicide, manslaughter, vehicular assault and other charges for allegedly driving drunk in Williamsburg, jumping a curb and striking pedestrians on a sidewalk, killing one and seriously injuring three others. The District Attorney said that, according to the investigation, in the early morning hours of July 16, 2016, the defendant, Nicholas Batka, 28, of Greenpoint, was drinking with friends at The Whiskey, a bar in Williamsburg. At about 3 a.m., while driving his Dodge Durango, the defendant jumped the curb near Bedford Avenue and North 8th Street, striking four pedestrians on the sidewalk and crashing through a fence in front of a nearby building. A cell phone video shows passersby preventing the defendant from leaving the scene after the crash. Andrew Esquivel, 21, suffered blunt force trauma and died hours after the crash. Three other victims suffered serious injuries and continue to receive extensive medical treatment. The defendant sustained minor injuries and was taken to a hospital, where he refused to submit to a blood test. But, according to the evidence, blood taken from the defendant about two hours after the crash showed a blood-alcohol level of .23, almost three times the legal limit of .08. The defendant, who was assigned to the Manhattan Transit Task Force, was fired by the Police Department a few days after the incident. He faces up to 25 years in prison if convicted of the top count with which he is charged. On July 29, 2016, near Avenue R and East 21st Street in Sheepshead Bay, defendants Yan Chen, 46, and Yuqub Liang, 57, allegedly approached the victim, a 62-year-old Chinese immigrant, several times and engaged her in conversation, gaining her trust and convincing her that she or a member of her family would die because of a curse. Defendant Yacheng Chen, 50, allegedly acted as a lookout. The defendants allegedly convinced the victim that in order to rid herself of the curse she needed to gather large sums of cash and jewelry and bring them to be blessed in order to remove the evil spirits surrounding her family. The victim did so — gathering $15,000 cash and the key to her safety deposit box. She then walked to her bank and withdrew an additional $50,000 and approximately $20,000 worth of jewelry from her safe deposit box. According to the investigation, Yan Chen, who had posed as a clairvoyant, told the victim to place the cash and jewels into a bag for Chen to perform a “blessing” to remove the curse. The defendants then allegedly stole the cash and jewels, and placed the bag on the victim’s shoulder and told her not to open it for at least several days in order to break the curse. The victim opened the bag that evening and found bottles of water. All of her valuables were missing. She then contacted the police. Brooklyn District Attorney Ken Thompson yesterday announced that a 26-year-old East New York man was sentenced to 17 years in prison for participating in a gun-point robbery of a bodega – part of a string of similar robberies of stores. The District Attorney said that, according to trial testimony, on the night of April 30, 2013, the defendant, Andre Brown, and two cohorts, Shaequan Monk and Kendell Jones, robbed G & P Grocery at 200 Pennsylvania Avenue in East New York, Brooklyn. The evidence showed that Monk pulled out a firearm and ordered the two store employees to the ground. Jones held the door and Brown, wearing a mask, jumped over the counter and emptied the cash register. The robbers then removed cash from the workers’ pockets and fled with about $800 in cash and a cell phone. The defendant and four others, all members of the Bloods gang, were charged for a string of robberies of delis and convenience stores, including G & P Grocery. The four co-defendants previously pleaded guilty to robbery and conspiracy counts and were sentenced to prison terms. Brooklyn District Attorney Ken Thompson today announced that a former New York City Police Officer has been sentenced to three years in prison following his conviction earlier this year for the repeated abuse of a young girl for nearly three years, starting when she was 10. According to trial testimony, the defendant, Jacob Sabbagh, 34, of Midwood, Brooklyn, was a family friend of the victim and would sleep over at the victim’s home in Flatbush approximately every month. The investigation revealed that on each of these visits, between June 2005, when the victim was 10, and March 2008, when the victim was 13, the defendant repeatedly groped and fondled her and, on occasion, forced her to reciprocate. The defendant went on to join the police force in 2009. He was fired from the force after his conviction this past June. The victim and her family moved out of the country and, when she was 16, the victim told her mother about the past abuse. The case was reported to authorities in the country where the victim lived and later referred to the District Attorney’s Victim Services Unit. The Victim Services Unit of the Kings County District Attorney’s Office can be reached at (718) 250-3820. Learn more about available services. 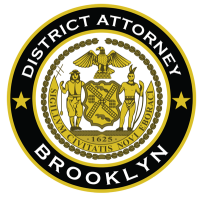 Brooklyn District Attorney Ken Thompson today announced that a 24-year-old former high school basketball player from East New York was sentenced to 15 years in prison for shooting his former roommate multiple times during a confrontation in broad daylight in a Sheepshead Bay courtyard. The District Attorney said that, according to trial testimony, on the afternoon of January 23, 2015, the defendant, Davontay Grace, and the victim, Dexter Hopkins, then 23, were having a short conversation outside of 2263 Batchelder Street in Sheepshead Bay. Grace then pulled out a .45-caliber pistol and shot Hopkins in the chest. With Hopkins on the ground, Grace fired five more shots, striking him in the leg and body. The evidence showed that Grace and Hopkins knew each other for years: they once played on opposing Brooklyn high school teams and later were roommates in a Georgia prep school. Hopkins managed to call 911 despite his injuries, positively identifying Grace as the shooter.